What do you do when there’s a classroom full of eighth graders staring at you, expecting to be entertained, and your job is to talk to them about science? This scenario is just one of many that our Community Engagement Program, now in its second year of operation, takes on. The engagement team’s job, in a nutshell, is to research, develop, and ultimately facilitate new ways to make STEM-themed subjects not only accessible, but really interesting to crowds outside the museum. That might be a class of 15 kindergarteners, an auditorium full of rowdy teens, or families at an offsite event. This kind of beyond-the-museum programming is crucial to the Frost Science mission of helping people of all backgrounds enjoy science and better understand ourselves and our world. pH INDICATOR TEST: To demonstrate chemical reactions, where molecular structures change, the Frost Science team starts with a lineup of cups containing clear liquid solutions of different chemicals (vinegar, baking soda, ammonia, etc.) They then add a seemingly magical liquid (a universal indicator) that turns each chemical solution a different color. How does the team do it? A good example is the way they developed and built one of our most popular shows, “Magic Science,” which they’ve presented over 50 times all around Miami-Dade County since its inception in 2014. THE FIRE RAINBOW: The finale of the show includes a fire rainbow which presents the concept of combustion through a fire demonstration. The Frost Science team uses a series of different chemical salts whose molecular composition or chemical “fingerprint” is revealed at high heat, turning their flames different colors. Lithium chloride turns red, copper chloride turns green, and so forth. This always leaves audiences cheering for science! The challenge was to add more science that included chemical reactions as a counterpart. 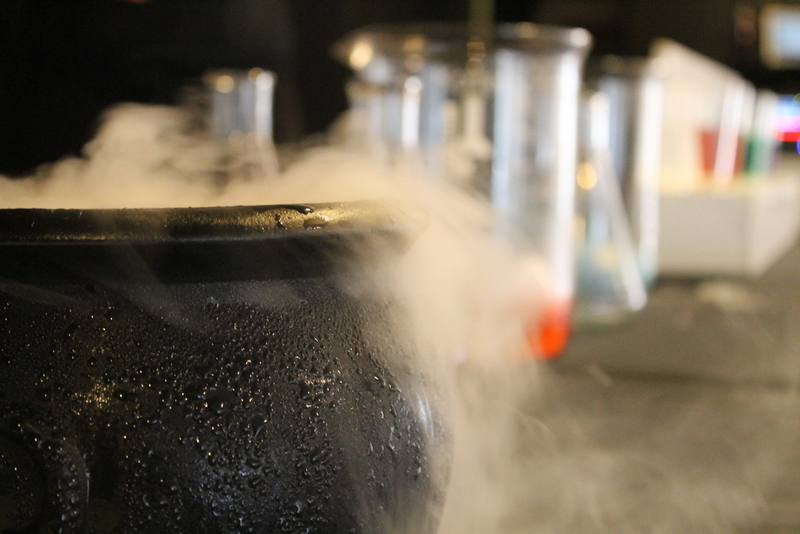 So the community engagement team investigated what different chemical reactions children studied at school, as well as key experiments that museum guests already loved, and then devised different modules of “Magic Science” around them. For example, they found that children were studying acids and bases, and that they loved our onsite pH-focused demos. To up the entertainment value of “Magic Science,” Mannina and his team decided to first present their chemical reactions as “magic” tricks that the audience had to demystify by using scientific inquiry. In that way, they worked as a team to reveal the STEM-themed explanations behind what first seemed like magic. So that’s the backstage story of our ever-popular “Magic Science” program!